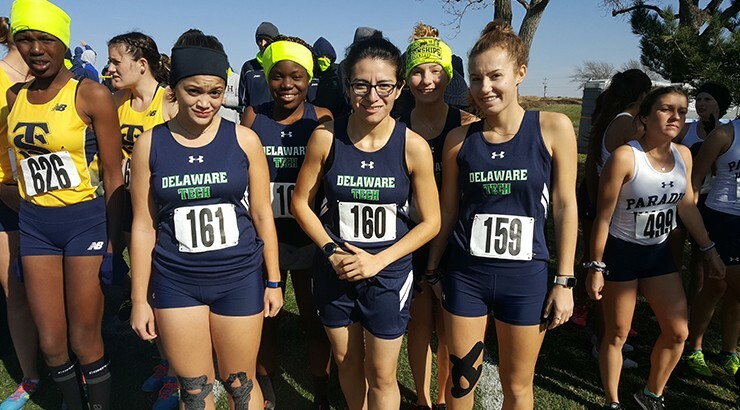 For the first time ever, Delaware Technical Community College's men's and women's cross country teams competed in the 2018 NJCAA National Championship Meet in November in Kansas. Both teams qualified for the meet after winning the 2018 Region 19 Division 1 men's and women's titles in October. This was the first time the women's team competed at the national meet, and the second time the men's team competed. Sophomore Dyce Bailey, the team leader this season, led the men's team with an 8K time of 30:12. He was followed by Michael Graden (31:22), Alex Nieves (32:06), Parker Chandler (33:01), Logan Hallee (33:31), Matt Phillips (33:52), and Stephen Constantinou (33:54). Sophomore Riccy Amaya, also her team's leader all season, was Delaware Tech's fastest female with a time of 25:37. She was followed by Elizabeth Allred (26:09), Lexi Allred (27:54), Paige Sharp (29:11), and Tessa Melendez (29:47). The national meet consisted of more than 80 teams and over 600 athletes. In addition to the amazing success on the course for Delaware Tech cross country, the team smashed another record by completing over 60 hours of community service during the fall season. Top: Delaware Tech men's cross country runners, from left, Xavier Scott, Stephen Constantinou, Dyce Bailey, Alex Nieves, Parker Chandler, Logan Hallee, Michael Graden, and Matt Phillips prepare to compete in the 2018 NJCAA National Championship meet in Kansas in November. Bottom: Delaware Tech women's cross country runners, from left, Tessa Melendez, Paige Sharp, Riccy Amaya, Lexi Allred, and Elizabeth Allred are ready to run at the 2018 NJCAA National Championship meet.